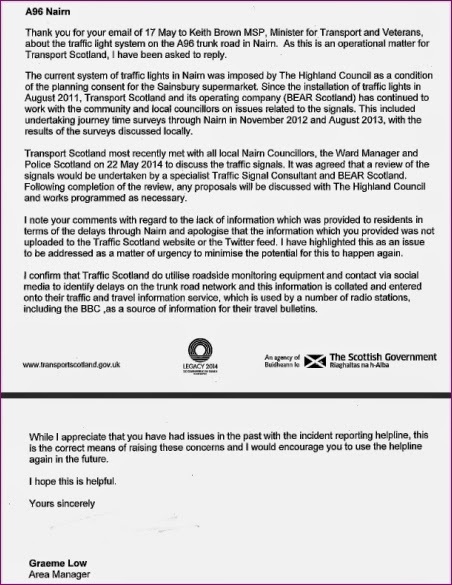 A Gurn from Nurn: Gurn Reader receives A96 response From Transport Scotland area manager. Gurn Reader receives A96 response From Transport Scotland area manager. If they have continued to monitor the situation, why have they not acted? It's not simply that some of the lights cause unacceptable delays, but also that the lights at Albert Street are dangerous - westbound traffic not only blocks the exit from Leopold Street, but also causes traffic to block the pedestrian crossing at that junction. Do we really need a school child injured there before anyone takes action?